I dodged a bullet today(actually having to make a real engine out landing). I started my plane, (a Rotax 912 powered Zenith 601) and it was running great. Taxi over to get some gas and when I go to restart, the engine runs really rough for 5 seconds then dies. It won't restart. I get it back to my parking spot and pull the top off the cowl. Low and behold both(not one but both) carbs have come loose from the rubber flange on the intake manifold. The clamps are tight so not sure how this happened. I get them back in, test run the engine for about 10 minutes. Everything still looks good so I do a couple flights in the pattern. Has anyone heard of this happening? Should I replace the rubber flanges(that's my plan)? Re: Has this ever happened to you? The carb rubber sockets must be replaced every five years, along with carb diaphragms, fuel hoses, oil hoses, and coolant hoses. I realize mandatory Service Bulletins are not really mandatory for experimentals, but this one is a really good one to comply with. This only happens when the carbs and not pushed forcibly back into the rubber socket. You should feel and here click or a popping into a curve type sound and feel it. If the carb is properly seated into the flange and the clamp tightened you can't even shove it out. I have seen several people push a carb into the flange and they think it is in all the way. I have demonstrated to some who have come into the shop by reaching over and with 1-2 fingers push their carb out of the flange. The carb needs to be seated into the flange all the way up to the carb body with no excess seen on the carb throat. When seated properly there is no way they will come out. The new flanges that have been our many years have an 8mm spacer in the clamp. The old style clamp did not and people over tightened it and cut the flange. The flange bodies have also changed many years ago. When I bought my plane 5 years ago the carbs were not only tightened in the sockets, there was a spring on top along with 2 wire ties, one on the top and one on the bottom, holding the carb in the socket to keep this from happening. I believe that SportCruiser did this from the factory, at least the spring, not sure whose idea the zip ties were. This may be overkill but my carbs have never moved. It's still like this today but here's the pic from nearly 5 years ago. 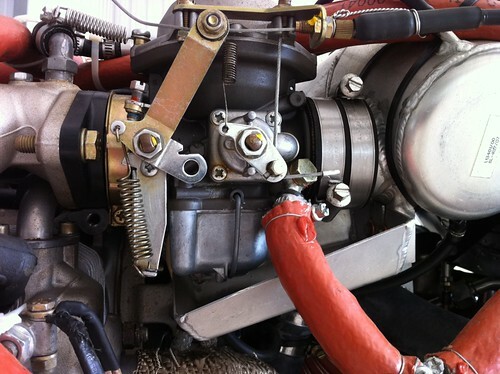 ShawnM wrote: When I bought my plane 5 years ago the carbs were not only tightened in the sockets, there was a spring on top along with 2 wire ties, one on the top and one on the bottom, holding the carb in the socket to keep this from happening. I believe that SportCruiser did this from the factory, at least the spring, not sure whose idea the zip ties were. This may be overkill but my carbs have never moved. That looks like a good idea. Well, it is about due for it's 5 year rubber replacement. As far as I know since I bought the plane no one has messed with the carbs. One did come loose when I had my "demo" ride but the previous owner's mechanic had fixed it. Remembering what happened that time was what made me look at them. My Sky Arrow ROTAX has those springs as well (visible on the upper left below. I assumed that was a stock ROTAX thing. Same here on my Sting -got the spring installed securing each carb - and yeah, I thought it came with the engine as well. The spring is stock Rotax. Any other things like wire tires to hold the carb on is not necessary. If the carb is fully seated in the flange and the clamp is tightened it WILL NOT come out even if you push it. They will only come out if improperly installed. So I checked things after my flights in the pattern. Things looked good so I completed my planned trip to 39N. Checked things when I got there and they were still good. Flew back no issues. So really not sure how this happened in the first place but I spoke with my A&P and I'm working on getting the parts I need to do the 5 year rubber replacement. I am curious -- why are the springs mentioned above factory-installed on the ROTAX/Bing carb? Could it be: 1) To provide some upward support to partially offset the hanging weight of the carb and its impact on the rubber socket?, 2) Alter/lower the frequency of carb vibration/resonance to reduce wear and/or fuel sloshing in the bowl?, and/or 3) Serve to retain the carb somewhat should it loosen from its socket due to improper installation? I suspect it is a combination of 1) and 2) with a wee bit of 3). You got it. A trifecta.